My husband and I both love long weekends, and Thanksgiving weekend is one. None of us really wanted to spend the long weekend at home, when we could be outside traveling, hiking, photographing or just to be with nature. We took advantage of the four day weekend and drove to the Grand Canyon, Arizona. To start our trip, we left early morning on Thanksgiving day to arrive in time for the sunset. Our destination was on the South Rim of the Grand Canyon. It cost $25 to enter the park by car. Fortunately we still have our Annual National Park Pass. Inside the park, they offer different accommodations (place link of hotel site here) along the rim with restaurants and shops, ranging from $85- over $400. We stayed at the Bright Angel Lodge, a good priced room ($85/night) with own restroom with sink, a small refrigerator, no television and a common shower rooms along the hallway and free wifi. But of course we were not there for the food and room. We were there for the canyon. Bright Angel Lodge is just few steps away from the rim. Our first sunset shot was just right out of our lodge. There are free shuttle buses that operates on four routes inside the park, connecting the lodges and restaurants, shops, visitor centers, scenic overlook and trail heads. Just wait at any bus stop and enjoy the ride. Shuttle buses do not drive to Desert View. On the second day, we took a bus ride going to every point on the western part of the rim. Only park buses and cars with Scenic Drive Accessibility Permit can enter the Red Route. The Scenic Drive Accessibility Permit allows visitors with mobility issues entry to some areas closed to the public traffic. Permit is available at the entrance gate, visitor centers and hotel lobbies. We got one later that day, and enjoyed the sunset at Hopi Point. In the afternoon, before sunset, my husband hiked the Bright Angel Trail as far as he can reach. I just stayed in the room and rest (can’t do much of hiking for now because of my knee problem). He got carried away by the beauty of his surroundings and just keep going down, forgets the going down is easy, but going back up will take you double the time you spent going down. On our third day, we drove the east side of the canyon, up to the Dessert View Watch Tower. Then head back to Yaki point for sunset view. 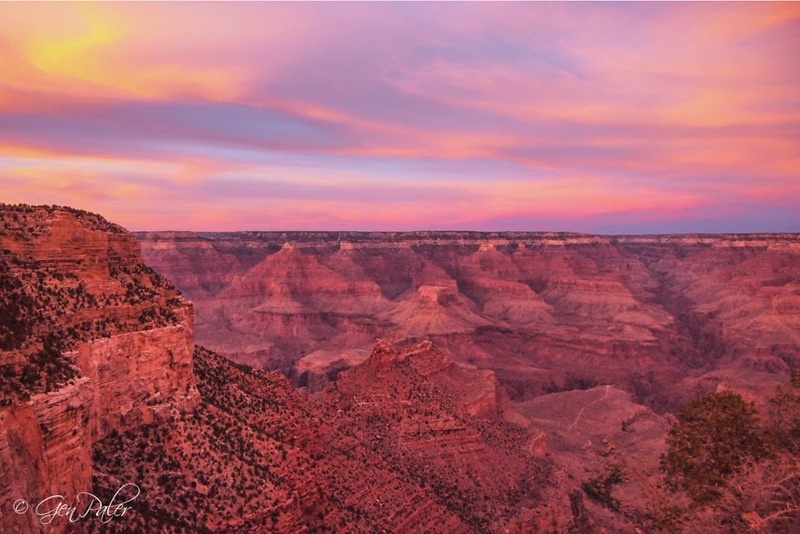 One can enjoy the canyons in different ways, you can hike, take a mule ride down and up the canyon, hire a hiking guide, take a helicopter tour, or simply ride the free buses that runs along the different look out points along the rim. 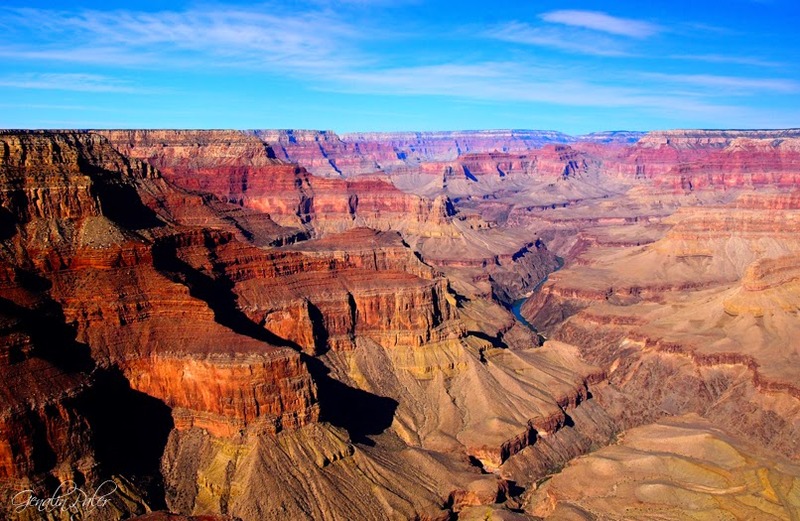 Whatever you decide to do, the Grand Canyon’s South Rim is totally worth the visit. Although the crowds are much smaller during the Fall and Winter season at Grand Canyon National Park, it is still important to reserve your room or camping spot as early as you can. Reservations are taken at www.xanterra.com up to one year in advance. The place is awesome! God’s masterpiece indeed!